NaNoWriMo is the pumpkin spice of the writing world. Come September, it starts seeping into everything a writer touches. By October, it’s ubiquitous. So when November rolls around, it’s inescapable. NaNo is a great excuse to hang up the “do not disturb” sign for the month of November, whether you’re doing it or not. If you’re not NaNo-ing, how else can you use those 30 days to become a better writer? If you’re already a writer who’s disciplined and working as much as you can, look at your comfort zone and where you might be able to break through it. Are you writing a little every day that never goes anywhere? Use November to pore over abandoned pieces and maybe link them or finish them. Polish them and submit at least one before November 30 and you could have a fresh publication credit by the end of the year. NaNo is made for fiction writers but not all writers create fiction. Many of us are poets or memoirists (or would like to be). The nonconformists among us looking to co-opt NaNo might want to use November to create our own November challenges. Write a poem a week; use Mondays and Tuesdays to explore ideas, write on Wednesday, revise Thursday, rewrite on Friday, and ask for feedback over the weekend. Use your favorite writing prompts as the impetus for memoir instead of fiction. Write a memoir every day in November, even if it’s only a sentence or two. At the end of November, reread and look for a uniting theme among the 30 pieces you’ve created. Flesh out those stories and gather them together. Do you have a collection or at least a good beginning? Lots of my NaNo friends are short story writers. Most of them use NaNo as an excuse to stretch themselves by working on novel-length fiction. Some like to use NaNo simply to create longer short stories. Usually they write five 10,000-word stories, which they plan in October. Those stories tend to have a connecting thread, like a character who appears in each story or a theme that carries through every story. The NaNo police are not going to show up at your door and tell you your work for November doesn’t “count” because you didn’t write 1667 words per day on a single piece. You win NaNo by having 50,000 words of original fiction written in November. You don’t edit yourself as you go. You don’t delete paragraphs that aren’t working. So who cares if you realize on November 10 that this piece is complete? End it and begin something new. If you’d like to connect them later, you can, if it makes you feel better about the way in which you participated in NaNo. NaNoWriMo’s Young Writers program allows the setting of a word count of your choice as a goal. NaNo Rebels maintains a discussion board at the official site (search it; if you read this after 2014, this link to the welcome thread may no longer be valid). Okay, you’re a fiction writer. You want to write a novel (or another novel). 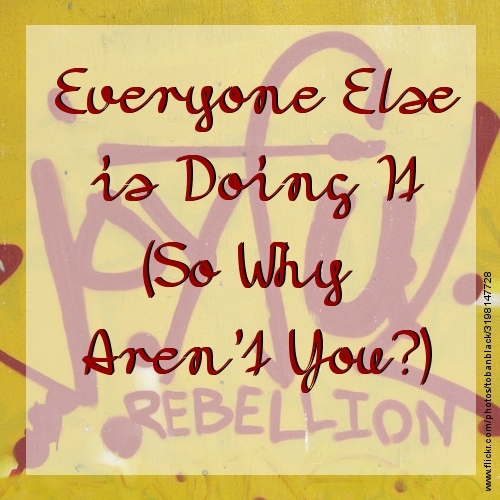 You’re down for NaNo… but uninspired. Still, you want to go to the coffee shop and answer “I’m doing NaNoWriMo” when the person beside you asks what you’re doing. Do you have a character in mind? It doesn’t have to be a main character. Write that character’s background story. You can fill out a Character Development Worksheet. You can write diary- or blog-like paragraphs from any time in the character’s past. Take an online quiz, giving the answers a character would give. Try a Myers-Briggs Type Indicator test for the character you have in mind to learn more about him. Everything you write about the character is fiction. You can count it toward your total word count of fiction on your NaNo project. You might be able to get a novel off the ground by the end of November but you might not. You can create your own NaNo project by creating 10 original characters (one every three days) and writing 5000 words about them, from their names to the story of their first heartbreaks. You might put them all into a single project or you might hang on to them until you find their stories. NaNo has no restriction on genre. How many genres are your NaNo friends working on? NaNo is a great excuse to write in a new genre. Start something fresh or take a false start and continue it. If you feel your fiction pulling you toward horror or sci-fi, follow it. If it doesn’t work, go back to where you consciously began the new genre (maybe a little further back than that), and try a different path. If you were writing a romance novel that turned into erotica and fell flat, think about why it wasn’t working. Character motivation? A setting that didn’t add to the plot? A word that you were uncomfortable putting into your narrator’s vocabulary? Change it up and give it another shot. None of your writing will be wasted. If you’re not into creating a single 50,000 word project for November but you’ve set the goal of daily writing or reaching 1667 words of fresh fiction per day, practice with prompts. You can find writing prompts right here at TC, at Twitter, at Pinterest, and all over the web. Again, you can connect your daily pieces later if you want a more coherent feel to the work you’ve done in November but there’s no rule saying you must reach someone else’s goal. If you use NaNo to get into daily writing practice, you “win” when you have 30 prompts that worked for you, even if it was a few sentences jotted down in a Moleskine book before bed. Lots of journals and publishers have contests going on in November (TC included) and with so many writers focusing on NaNo, you have a better chance of making the cut. That’s not to say that you can slack; you never want anything less than your best out there. But you can spend November writing a single short story that gets published rather than a 50,000 word novel that will never see the light of day. When prospective NaNo-ers are writing outlines, you can research markets, publishers, and agents. October and November are opportune times to send your polished query to an agent. When the agent requests more from you, you’re ready to go. If an agent or editor responds to your piece asking for a few edits, you’re not caught up in NaNoWriMo madness. You’re ready to fulfill those requests. As always, you’ll be writing to keep from watching your inbox, but you won’t feel the pressure that NaNo writers are feeling. Your November harvest could be a publication credit, a signed book contract, or the payment for a short story. Keep your goal specific, like “research and query one agent per week” or “research markets every MWF and submit on the weekends.” Specific goals are harder to slack on. Even if you’re eschewing NaNo to the point of taking the month off of writing, send something out. TC’s inbox is most swelled in January when the New Year’s resolution to submit inspires writers. Beat the rush. Submit something in November for publication. Send a piece a week to the journals you’ve researched. Find the best possible fits, follow the submission guidelines, and send it in. There’s more going on in your local real world of writers than NaNo. In addition to write-ins, there are workshops at bookstores, libraries, and cafes. Everyone will be talking about their NaNo frustrations while you show up with a story (with a beginning, middle, and end) ready for feedback. It’ll be a welcome distraction for the NaNo-ers and you’ll come out with some fresh opinions. Implement one of our A Pen In Each Hand accompanying exercises (culled from the above), get yourself a lovely seasonal beverage, and enjoy the month of November. Pumpkin spice: optional. 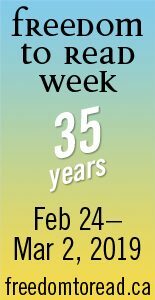 Join National Novel Writing Month (NaNoWriMo) and write 50,000 words on a single piece of fiction. Write 50,000 words of fiction spread among several projects. Write ten 5,000-word short stories. Write 50,000 words of memoir or non-fiction. Write in a new place at least once a week. Create ten new characters; work on their character backgrounds three days each. Write fresh fiction every day based on a writing prompt. When you hit 1,667 words, stop for the day. Pick up the unfinished pieces in December. Write anything in a new-to-you genre. Submit four or more pieces for publication, at least one per week. Spend the first two weeks of November researching markets and the remainder of the month submitting. Research and query one or two agents or publishers per week. Attend a workshop or write-in. If you can’t find one, create one. Maybe you’re already a winner (congratulations!) and are psyched to continue writing. 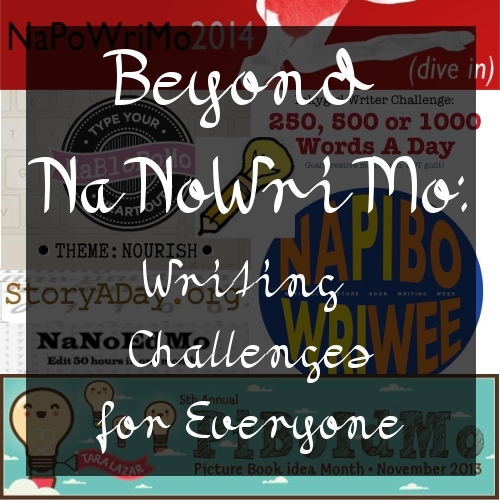 Either way, what you need right now is… Beyond NaNoWriMo: Writing Challenges for Everyone. 100 words a day = 36,500 words in a year. 250 words a day = 91,250 words in a year. 500 words a day = 182,500 words in a year. 750 words a day = 273,750 words in a year. Keep in mind that 80-100k is a good length to aim for if you’re writing a novel. See Colleen Lindsay’s breakdown of novel lengths for specifics. In other words: by writing just 250 words day, you could finish a novel in a year. Are you a fan of writing challenges? Which ones have worked for you? It’s Day 5… How are those NaNovels coming along? Now get back to it! Write, write, write! You can do it!